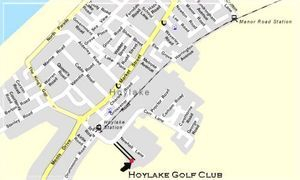 Hoylake Golf Club is situated on Carr lane off the A553 between Hoylake and West Kirby, 10 minutes from Junction 2 of the M53 and less than 1 hour from Manchester International Airport. We are close to Hoylake railway station (Mersey Rail line). From Southport follow A565 to Liverpool. From Preston follow A59 to Liverpool. From Leeds and North Manchester region follow M62 to Liverpool. In Liverpool, follow signs for Wallasey (Kingsway) Tunnel and then take M53 signposted Chester and North Wales. Leave M53 at Junction 2, follow A551 to Moreton and then A553 to Hoylake. Turn left at the roundabout in Hoylake (railway station is on the left) and the Club is 400 yards along on the right. From South Manchester and Airport, follow M56 (Chester and North Wales). At Junction 15 transfer to M53, signposted Birkenhead, exit at Junction 2 and follow directions above. From Chester take A540 signposted Hoylake - in approximately 18 miles pass through West Kirby (railway station on right) and continue along A540 Meols Drive for 1.5 miles until you come to a roundabout, turn right (railway station is on the left) and the course is 200yds on your right. Club professional Dave O'Connor (0151-632 2956).